Our deep-undercover Russian operative Quasar brought up this page today, which he figures is a petition to get Nine Inch Nails to perform in Poland. I don't think they've ever played Poland before, so if you live in Poland and will pay to see Nine Inch Nails perform, this is the place to go and sign up. On Monday, September 29th at Noon (PST), Waxploitation Records will release a limited edition vinyl split 7� featuring two songs produced for the video games Enter The Matrix and American McGee�s Alice. It will be exclusively available online at the Waxploitation store (http://www.waxploitation.com/store). Side A features a previously unavailable CHRIS VRENNA (aka TWEAKER) remix of �Wonderland Woods� from the score to the cult classic American McGee�s Alice. Side B features the original song �Take The Pill� from the blockbuster Enter The Matrix, produced and composed by Vrenna. American McGee and Chris Vrenna will sign and number the first pressing (500 copies). The album cover was specially designed by American McGee exclusively for the release. In addition to his current recording incarnation TWEAKER, Vrenna was one of the founding members of Nine Inch Nails. Vrenna has produced and composed music for video games including Enter The Matrix, American McGee�s Alice, Quake (as a member of NIN), as well as the upcoming Area 51 title for Midway. The Kerrang! article contains a misquote. Danny Lohner actually said he was going to the NOLA studio to check some things out and that the new NIN album will be out at the end of the year! That's what we like to hear!. Danny Lohner, who appears to be the official NIN spokesperson of late, talks about the Underworld soundtrack and a little about Tapeworm in the latest issue of Kerrang! magazine. "Trent Reznor is like my mentor. I don't compete with him. He's on a another level when it comes to things like that." Danny Lohner, longtime bassist/guitarist/programmer with Nine Inch Nails, is aware that he's got a lot to live up to. NIN mainman Reznor famously revolutionised the art of movie soundtracks with his groundbreaking work on Oliver Stone's Natural Born Killers and David Lynch's Lost Highway. Now Lohner has followed in Reznor's footsteps and put together the soundtrack to acclaimed Brit vampire flick Underworld. It's been suggested that much of the music on the Underworld soundtrack was originally written for Lohner's Tapeworm project, the semi-mythical supergroup that has, in five or so years since its inception, featured contributions from Reznor, A Perfect Circle/Tool frontman Maynard Keenan and Pantera's Phil Anselmo. Lohner insists that Tapeworm remains a separate entity � it currently features himself, Reznor, Keenan and former 12 Rounds drummer Atticus Ross � although he admits his frustration that it has never seen the light of day. "I know, man, it's a joke," he sighs. "It's painfully close to being finished. We've got a whole Tapeworm album ready to mix. What happens is that we do the songs, then everybody has to go off and do their own thing. We actually got to a point during the last Tool tour, where we were all really focused, and we were planning to get the record out by Christmas 2002. Then we got into some legal scenario � Maynard was signed to one label, Trent to another, blah blah blah to cut a long story short we ended up shelving it yet again." With Tapeworm still on hold, Lohner is gearing up to start work on the long-awaited follow up to Nine Inch Nails' 1999 masterpiece The Fragile ("I just spoke to Trent the other day," he says. "I'm going down to New Orleans to catch up with him and see where it's at.") And he's not ruling out hooking up with Messrs Borland and Patrick again. "I'd love to work with Wes and Rich in the future," he says. "I'd love to get in a van and tour the country, just like the old days. Play the clubs that we played when we were coming up. That'd be cool." Thanks to Matildauk for transcribing the article and sending it in. Bowie mentions Trent Reznor in an article on Rolling Stone. What musicians impress you the most now? "Beck is tremendous, the chances he takes. And I feel that when [Trent] Reznor produces his next piece, it will be really magnificent..." Thanks Deadpool5. A brief article with Danny Lohner talking about the process of gathering the artists together for the Underworld OST can be found here. Thanks to Heather. 8:30pm update- Danny Lohner was on Headline News at 8:15. Perhaps it will run again?? In any event it was a good interview about the Underworld OST. Thanks to JPD. Today marks the 4th anniversary of Nine Inch Nails' most recent studio album, The Fragile. Happy Birthday The Fragile! Rolling Stone has an interview with Danny Lohner about his involvement with the Underworld sountrack that can be read here. Thanks to all who sent in to us. With a little net research this is an easy one! Send the correct answer to this addy. A randomly chosen winner with the correct answer will be notified Monday evening (9/22). One entry per person. Also- don't forget to check out Underworld- which opened this weekend! Cinescape had a brief article about Monday's premiere of the stylish vampires vs. werewolves flick Underworld. 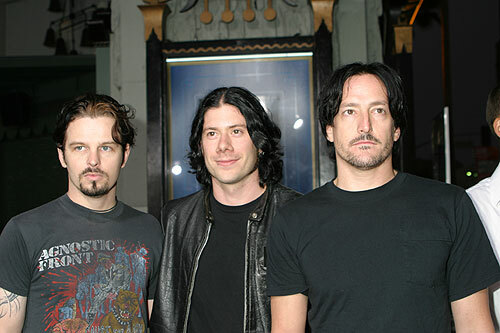 Among the red carpet shots was a photo of Wes Borland, Danny Lohner, and Richard Patrick of the Damning Well, one of the many collaborative groups found on The Underworld Soundtrack. Thanks to ManBurning! 2:11 update: WireImage.com also has a couple of pictures from this premiere, here. Mind you, you have to pay for the full-size image, so all I can do is link the thumbnail off their server. Midway Entertainment has brought on Chris Vrenna to compose the soundtrack to their first-person shooter, Area 51. Featuring online play for the PlayStation 2 and Xbox� Live, Area 51 is set in the U.S. government�s most top-secret and secure facility located in the Nevada desert. Players take on the role of Lt. Nick Cross, a hazardous biological waste specialist sent to investigate. During his investigation, Lt. Cross stumbles across alien creatures and a virus that threatens his very humanity. To save the earth and himself, Lt. Cross must fight to solve the enigma of Area 51. The soundtrack will most likely see a release on Waxploitation, which publishes The Alice Soundtrack, and will be seeing over the release of the new Tweaker album, 2am Wake-up Call, early next year. You can download a minute-long preview of the new album from here. 2am Wake Up Call features new collaborations with David Sylvian, Will Oldham, Azam Ali of VAS and Mellowdrone. Yo, check it. For those of you who are interested in taking a closer look at Trent's ultra-swanky recording studio, nothingstudios.com has just updated with a brief synopsis of the studio, a list of Trent's gear, some totally neat photos, and (a little) more! "Johnny Cash's version blew me away," Lohner said. "He has such a great character voice...that video is so moving and so well done, and with his wife watching him as he sings it...I don't know if I'm just being silly or what but it just really touched me, and I know Trent (Reznor) felt the same way." Thanks to The NIN Historian. why was nin.com down so long? seems as though we're up and running again. in case anyone was wondering, the delay was due to the nyc blackout, which, because of a generator failure at our data center, destroyed a lot of the data on our server and fucked up the back-ups as well, so some time was needed to reconstruct the message board system. everything should be working, although your profile pictures were lost so you'll have to upload them again. enjoy! Thanks to Marcus for pointing that out. Rejoice, for the nin.com access boards are working again! Awesome! Country music icon Johnny Cash has passed away this morning at the age of 71. As you all know by now, Cash recently recorded a cover of Nine Inch Nails' song "Hurt", which received much critical acclaim, but he has done so much more than that. If you haven't already, please take time today to take a look at the man's amazing career, and keep his family in your thoughts. Thank you. Note: For those of you who were wondering why nin.com is blank today, this is why. Void99 heard an interview with Danny Lohner just a few hours ago on 99X (99.7 FM)in Atlanta. If time permits--- WYSP Philadelphia towards end of day. Danny Lohner is most recently credited with producing and performing on the soundtrack for the upcoming movie Underworld. Billboard will have an interview on or about September 28th. Smear yoghurt on your Nine Inch Nails CDs. "I often change CDs when my hands are wet with beer," he told the British weekly. "One night I must have changed the CDs, touched the data surface, then left them for use on another night." The following week, he put on a CD by Nine Inch Nails and found that it would not play properly because fungus had grown on it. Not convinced? Listen for yourself. Dr Jones applied aluminium zirconium tetrachlorohydrex - glycine complex to his copy of And All That Could Have Been. I haven't heard it myself yet, being at work, but you can download RealAudio and MP3 clips of the result. And if that's not relative enough for you, there's even a picture on that page from an article about Jones' project that shows him holding a CDR with his mucked up recording of Hurt from AATCHB on it. Get 'im, RIAA!! Spin Magazine decided that The Downward Spiral was one of the Top Ten Industrial Albums of "all time". While Spin Magazine is no definitive authority on this topic, the editor did pick a rather interesting list. Along with The Downward Spiral are albums by Einsturzende Neubauten, Ministry, Throbbing Gristle, VNV Nation, Skinny Puppy and every other token industrial band. Also in the same issue of Spin is a review of The Thirteenth Step that isn't all that great. On the positive side, the reviewer had no clue what he was talking about. Congrats to the newlyweds- Leviathant and Mormolyke! "Music industry executives say companies like Universal typically offer stores about $1.20 in promotional subsidies for each CD sold to retailers for $12. Now Universal is keeping that $1.20, but lowering the wholesale price to $9 instead of $12." Universal Music Group owns 30% of the CD Market, including Nothing Records. Therefore, you can expect the prices of all Nothing releases, along with any Universal Music Group release, to drop by a few dollars in near (or far) future.